The 3T exam is “10 times more sensitive than an Open MRI” and “2 to 4 times more sensitive than a standard 1.5T” closed field scanner. How does a MRI Work? Magnetic Resonance Imaging (MRI) is a technique used to see detailed internal structures. 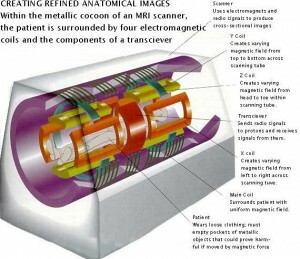 A MRI machine uses a magnetic field to line up the magnetization of some atomic nuclei in the body, and radio frequency fields to systematically alter the alignment of this magnetization. This alignment causes the nuclei to produce a rotating magnetic field detectable by the scanner. This information is recorded to construct an image of the scanned area of the body. For the MRI test, the area of the body being studied is placed inside a donut shaped tube that contains a strong magnet. Pictures from a MRI scan are digital images that can be saved and stored on a computer for more study. In some cases, contrast may be used during the MRI scan to show certain structures more clearly. MRI shows contrast between the different soft tissues of the body, which makes it especially useful in imaging the brain, muscles, heart, joints, blood vessels and cancers. A contrast material called gadolinium may be injected into a vein to help improve the information seen on the MRI images. Gadolinium does not contain iodine and, therefore, rarely causes an allergic reaction or other problem. However, if you have a history of kidney or liver disease, you should advice the technologist or radiologist before the MRI procedure begins. Before entering the MRI room, you will be asked to change into a gown, and asked questions regarding the presence of implants. You will be instructed to remove all metal objects from your pockets and hair. Before the exam, you will be asked to fill out a screening form to identify anything that might create a health risk or interfere with imaging. Items that need to be removed by patients before entering the MRI system room include: Purse, wallet, money clip, credit cards, cards with magnetic strips; electronic devices such as beepers, cell phones, hearing aids, metal jewelry, watches, pens, paper clips, keys, coins, hair barrettes, hairpins, clothing that has a metal zipper, buttons, snaps, hooks, under wires, or metal threads, and shoes, belt buckles, or safety pins. 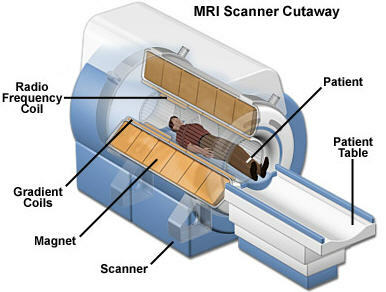 The scan consists of the patient lying on the MRI scan table for about 30 minutes. One of the most obvious things that patients note is a loud banging noise from the scanner. The patient will be offered earplugs in order to minimize the effects of this noise or be allowed to listen to music by headphones. At all times, the patients will be in direct radio communication with the technologist who will be in the adjacent room. How Can I get the Exam? The exam must be ordered by your doctor, but you can choose where to have the exam performed. Simply ask your doctor to refer you to Comprehensive Diagnostic Imaging.